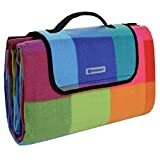 The picnic blanket is featured with soft fleece top and waterproof backing on the underside. Treated with Thermal composite process, the blanket is flatter and more tear-resistant. With the extra large mat, you can enjoy the leisure time with your family for lounging in parks and also on beach. It offers a great relaxation after a busy day. The blanket has large size to provide suffucient space for several adults and toddlers. In addtion, it is lightweight and compact. You can simply and quickly roll he blanket up with Verlco and store in the boot of the car.